I am very pleased to announce that you will be able to see some of my work on display at the upcoming Fibre Content Show that will be at the Art Gallery of Burlington from September 6-16, 2018. The show will display 90 pieces from 60 artists from across Ontario including one of mine! Opening Reception is Sunday September 9th from 1:00 to 3:00. The Art Gallery of Burlington is open from 9:00 to 9:00 Monday through Friday, and 10:00 to 5:00 on Saturday and Sunday. Admission to the show is free, parking is a minimal charge and catalogues will be available for $10. In conjunction with the show, there are six Artists Talks and Hands on Events that require tickets to be purchased. They are scheduled for both Saturdays, the 8th and the 15th, and all details are on the links and websites. 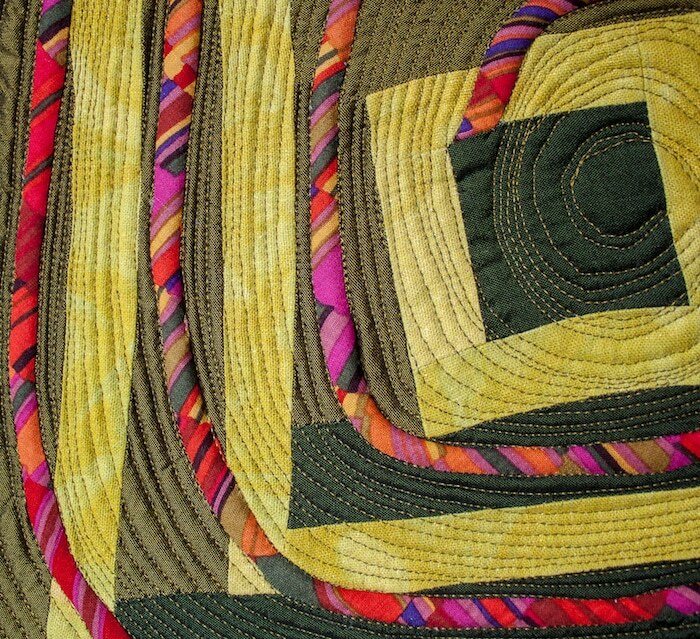 I hope you plan a visit to the Fibre Content Show to see an outstanding display of textile work. 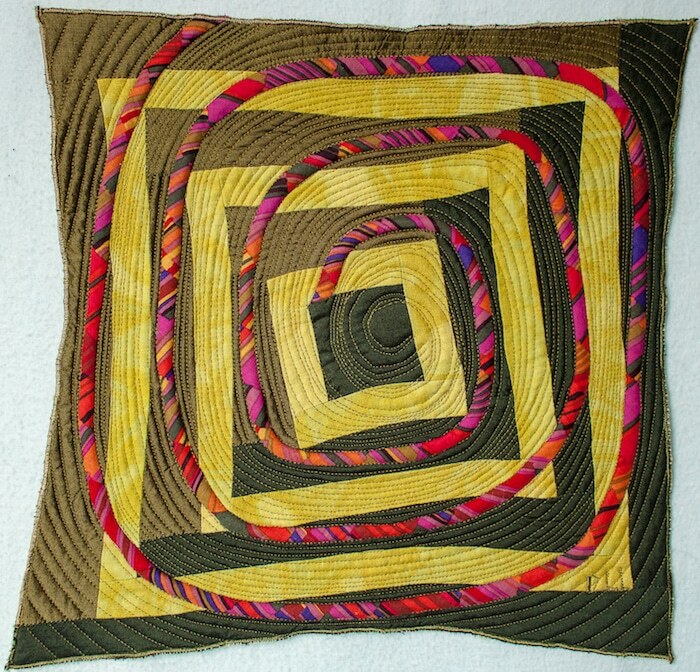 My first ever SAQA challenge is finished. I wrote about the piece in progress and it is now complete. My inspiration was a glass of Gin and Tonic – a tall cool summertime drink. 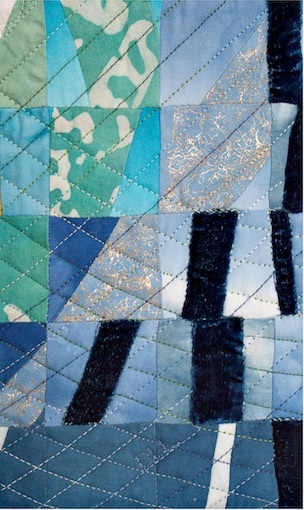 I picked out a selection of hand dyed fabrics in all shades of blue from deep indigo to turquoise, to pale aquamarine. 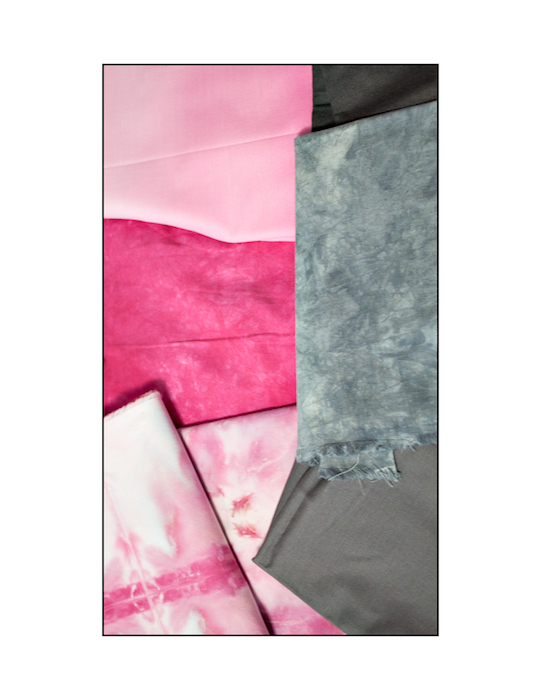 The texture of the fabrics range from soft silk velvet, metallic cottons, linens and canvas. I love the addition of the greenish-yellow metallic linen. It’s the perfect wedge of lime! I hope you have all had time to enjoy your favorite summertime drink! Purple and pink are her favourite colours and mine too! 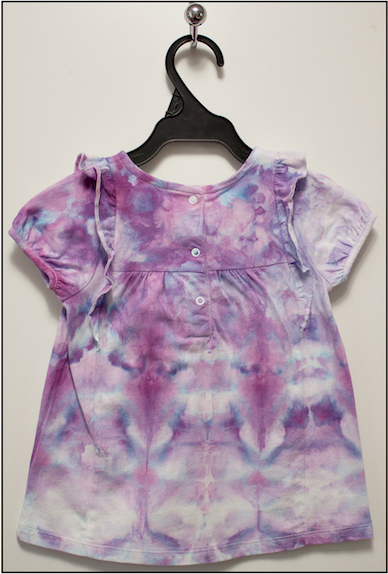 so it wasn’t difficult selecting the dyes that I would use to create some special gifts for a little girl. 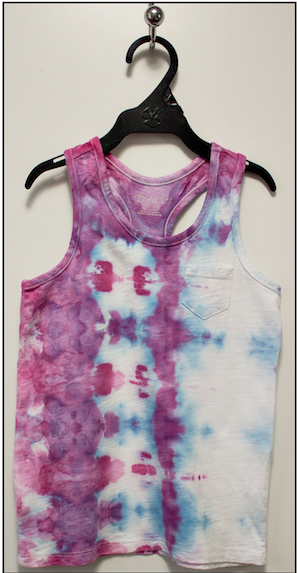 The tops were white to begin and with some folding, ice and time they became colourful, fun and summery! 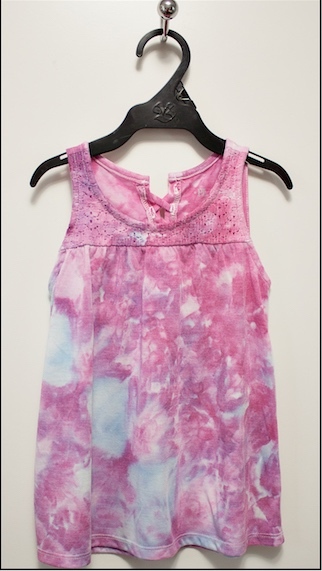 They will look great with the shorts and leggings in pink, blue and purple. For extra flair the blue leggings are sparkly! Just what every little girl wants! I can’t wait to see these on her. 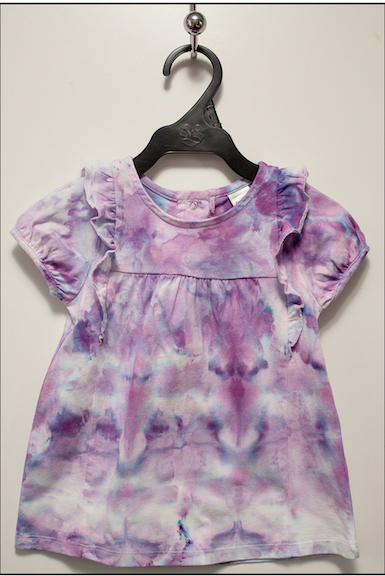 She will be the best dressed, most colourful child on the playground this summer! I am continuing my exploration of the log cabin. 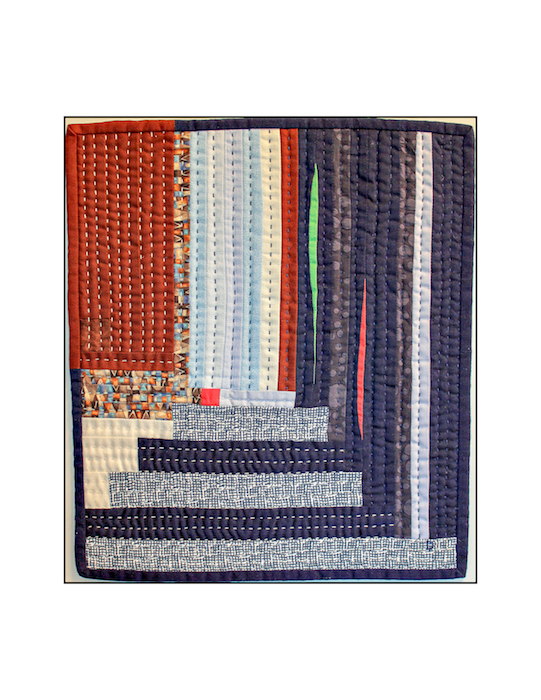 The selection below is destined for a minimal modern quilt using the traditional pattern in a new way. So far, I’ve sketched out the design and chosen the colour palette. I am continuing the series I started with In Order and am stretching it in new ways. I love having a structure to begin with and then thinking about the what can change. Do I add hand stitching? 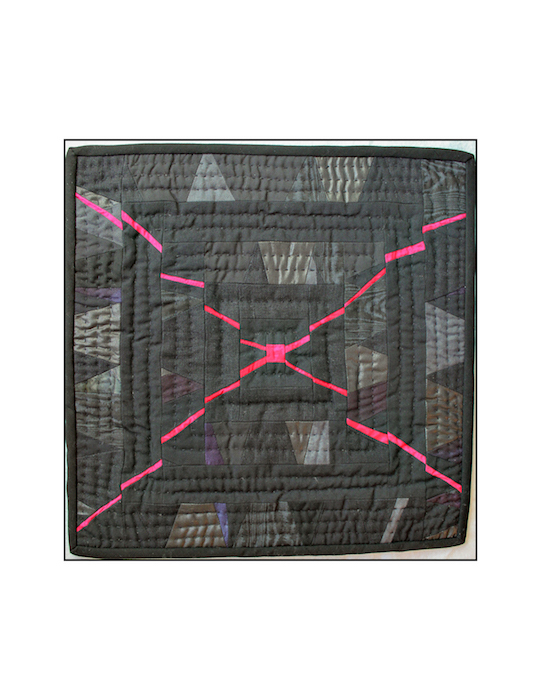 Machine stitching? Embroidery? Can I use more colours, patterns? What is the minimum? Looking forward to seeing how this new idea evolves. What traditional blocks have you played with? Fibre Content 2018: the misses! 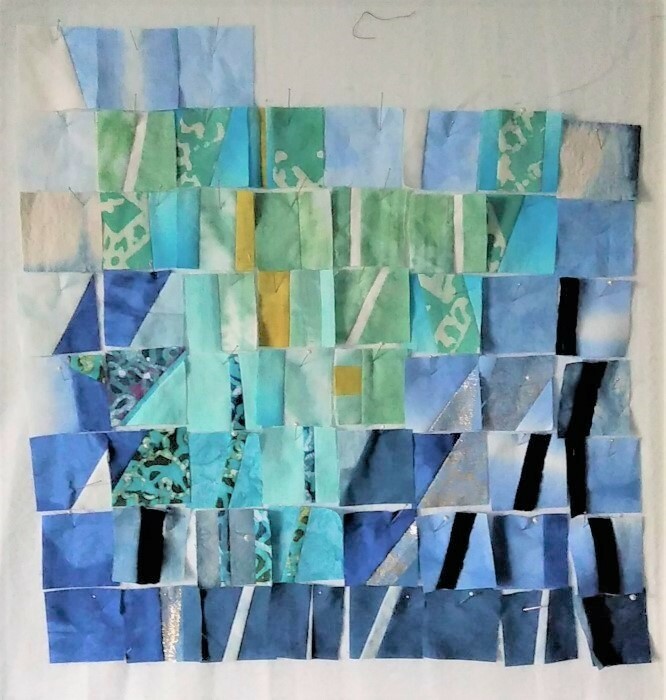 At the encouragement of a friend I submitted three pieces into the Fibre Content 2018 show being held in the Art Gallery of Burlington from September 6 to 16, 2018. One of the three was accepted! 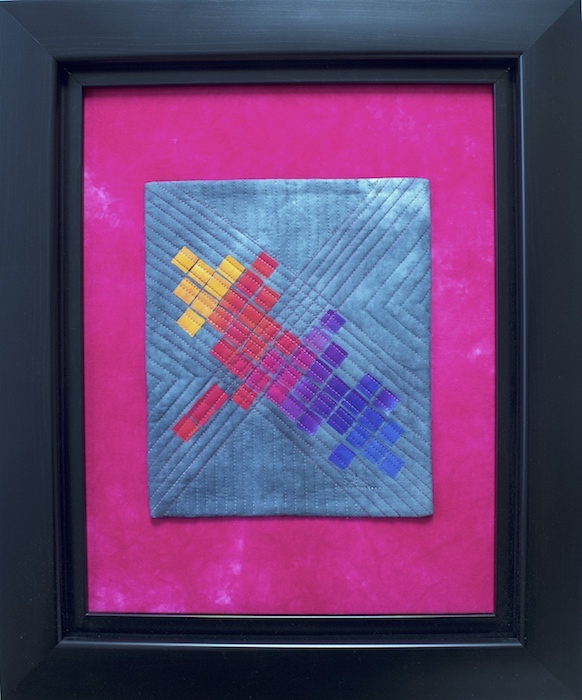 Fibre Content is an exhibit of Canadian fibre art with works in fabric, yarn, paper, and mixed media. Pixels are the smallest unit of information that makes up an image. What do the they reveal in Pixelation 1? Data 2.0 explores the connection between the pixelation occurring in digital formats and the ancient technique of mosaics. One obscures while the other creates patterns. 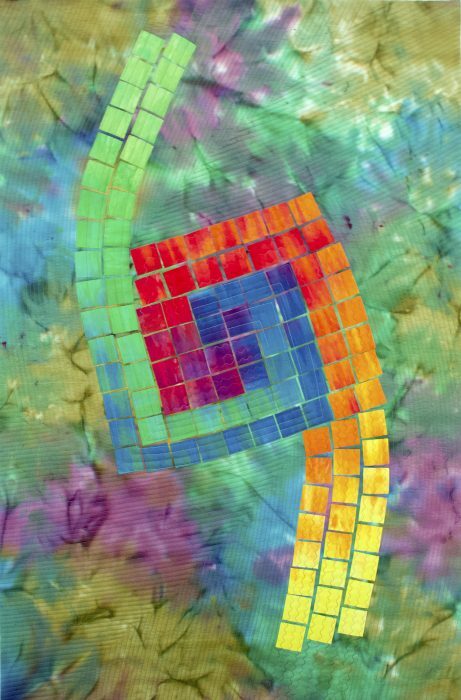 To see the textile painting that made it along with 90 other fibre art pieces, join me at the Opening Reception at the Art Gallery of Burlington on September 9, 2018 from 1pm to 3 pm. The show will be on from Sept. 6-16, 2018. 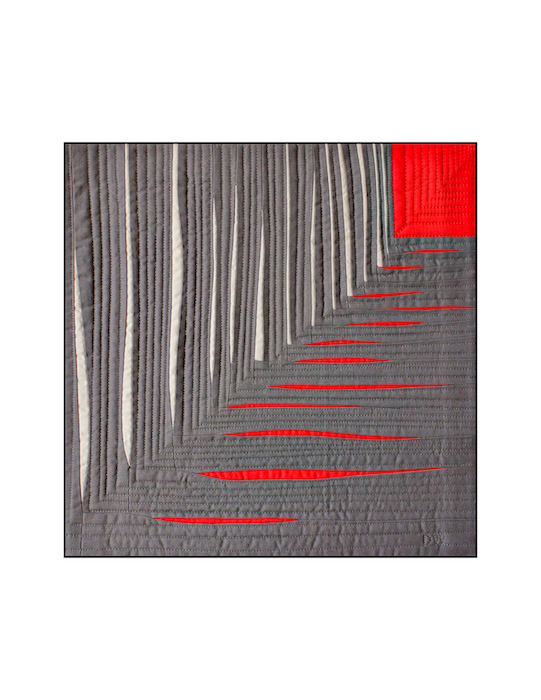 Visit the Burlington Art Gallery to see some of the best Canadian works in fibre. See you there! I became a SAQA member! 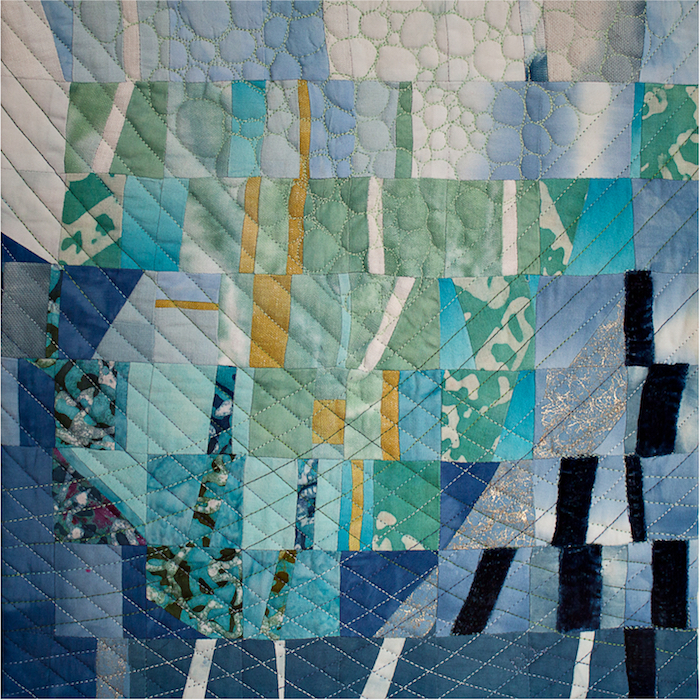 I recently attended my first meeting of the Studio Art Quilt Associates (SAQA). 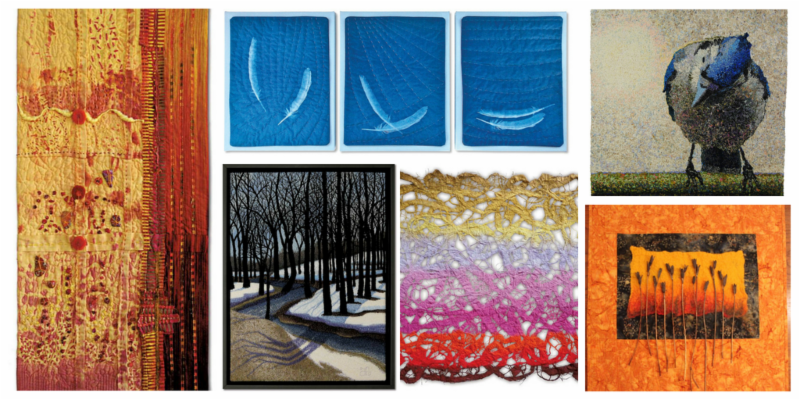 This large organization is divided into smaller regions and my local is SAQA Central Canada – Ontario and Quebec Artists. Because locals are large and cover so much ground geographically, smaller groups or pods are formed. The pod I attended was in Fergus, Ontario. A very enthusiastic and focused group of artists were in attendance. 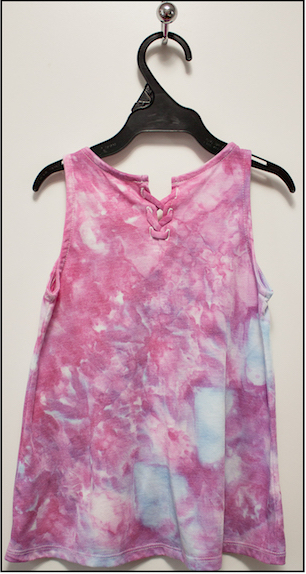 I began with some hand dyed fabric and imagined a tall glass of water and ice. 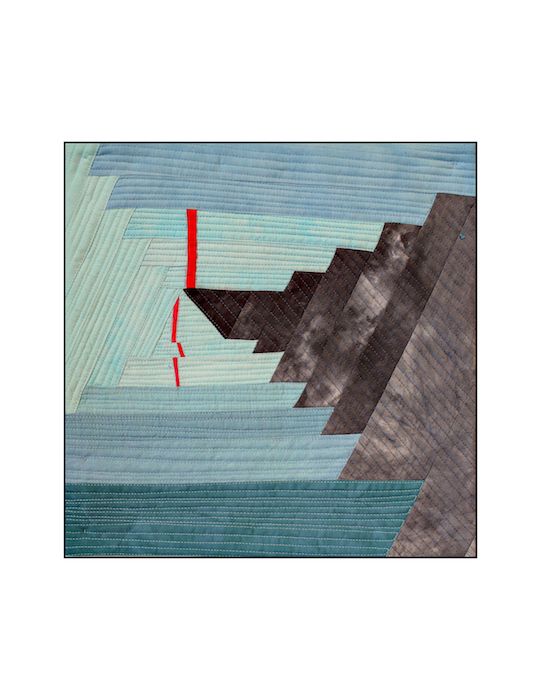 How would that look abstracted and constructed using small pieces? The two images are the evolution of my work in progress. 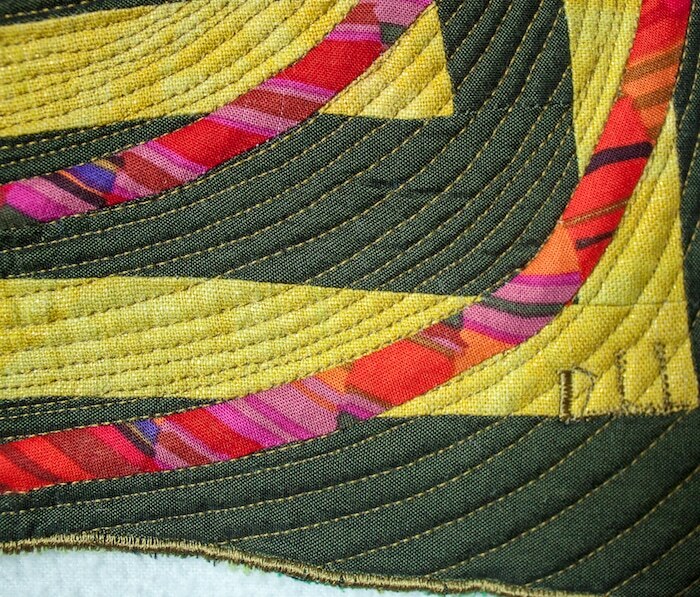 I may move a few more pieces around before I begin to stitch. What does summer look like for you? Since the snow is gone (yeah! 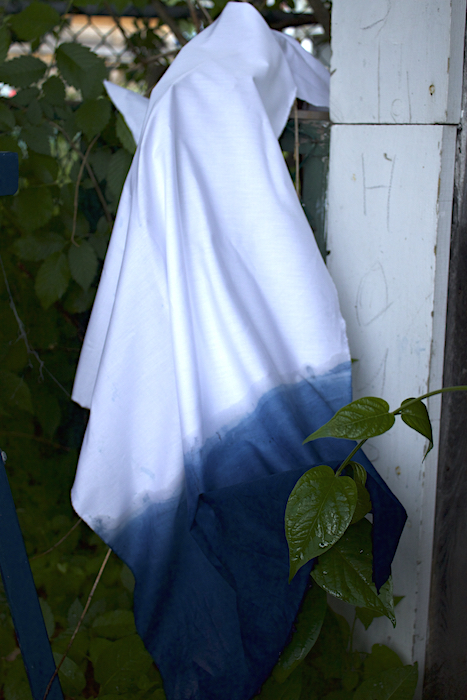 ), I began indigo dyeing. 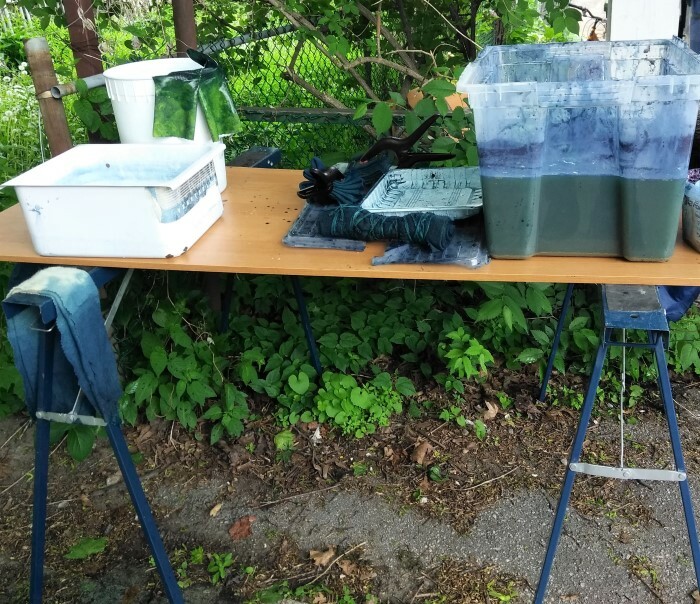 It was finally warm enough during the May long weekend to set up an indigo vat. 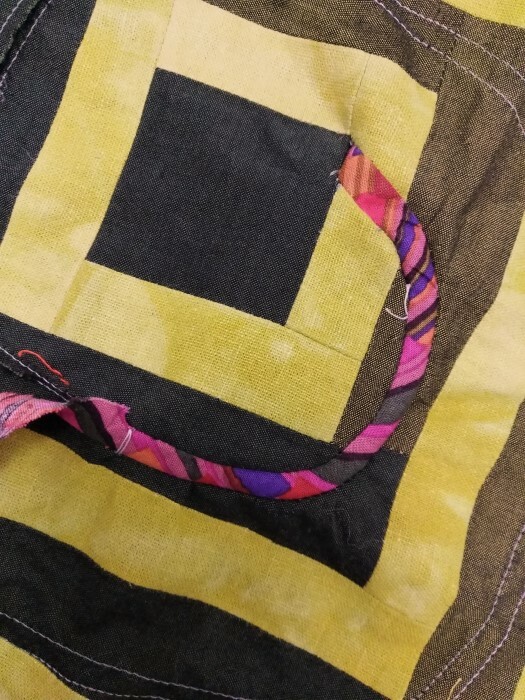 I happily spent much of the weekend dipping: two tablecloths, a dozen or more napkins, cotton/rayon scarves, linen handkerchiefs, and quilting cotton. Not ready to throw out the indigo vat, I stored it under our deck. A couple of weeks went by before I could get back to dyeing. I pulled out the indigo vat on Sunday to see if it was still viable. 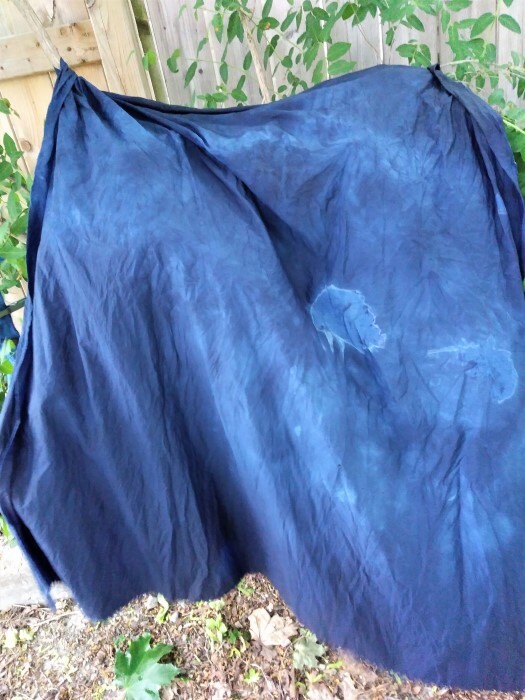 I tested a piece of pfd cotton and was surprised to find the indigo vat still had some life left! So I set up a makeshift indigo studio in the laneway. I experimented with some small pieces of wool suiting, pfd cotton, linen/rayon crinkle scarves, cotton voile and double gauze cotton. The last two are new scarves that I am excited to be adding to my shop. This pfd cotton has been dipped a few times and the colour is deeper than I was expecting. One of the wool suitings scrunched and dipped. 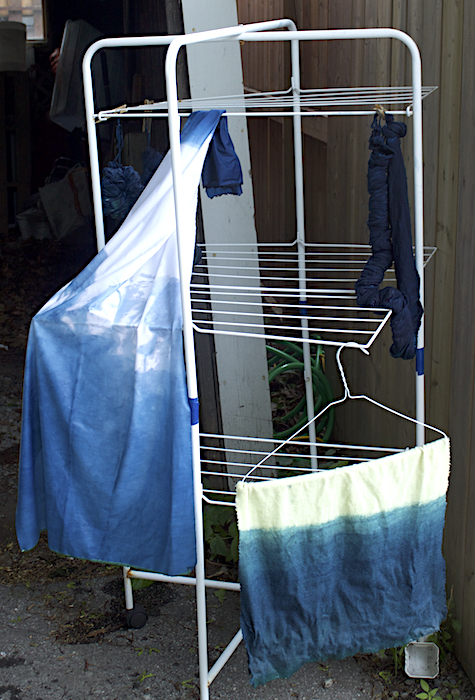 I didn’t expect the indigo vat to be viable so I didn’t have my drying rack set up. Instead, I used the bushes in our laneway. Another wool suiting rolled and tied. This pale yellow piece of wool has a few moth holes, but I love the yellow and blue together. My neighbour showed up with this rack that she was going to throw out. 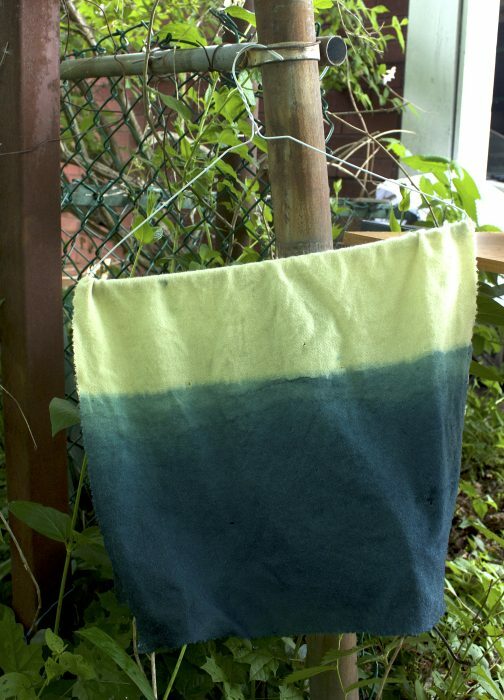 It is perfect to use for hanging up the indigo dyed pieces. 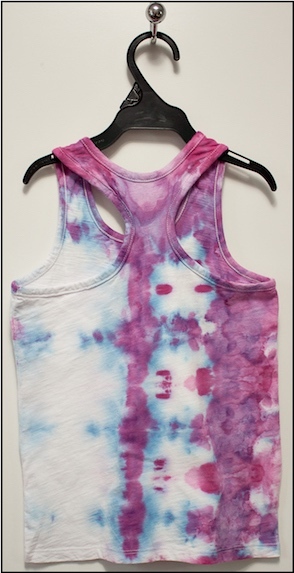 It just needs a little duct tape and will be a good addition to my dyeing supplies. 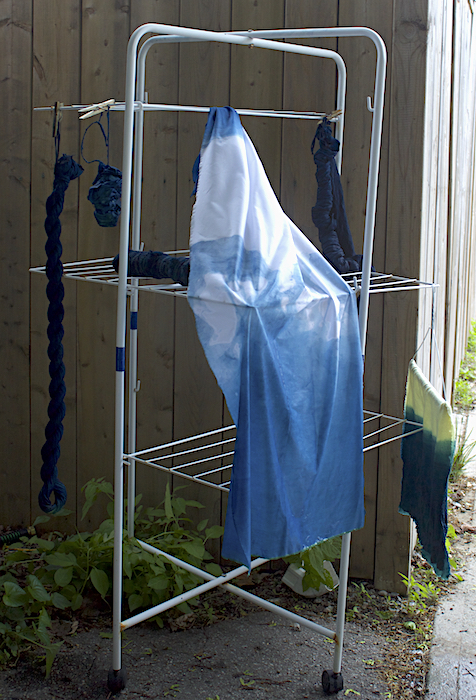 Here are a few of the pieces I’ve dyed during the second round of indigo dyeing drying on my new rack! 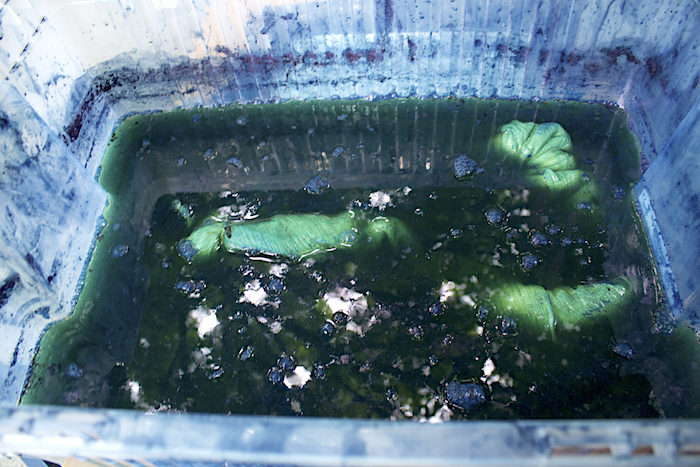 On Sunday, I left a piece of pfd cotton and a nui shibori scarf in the indigo vat overnight. On Monday, I pulled out the scrunched up pfd cotton and was happy to see a rich blue colour. 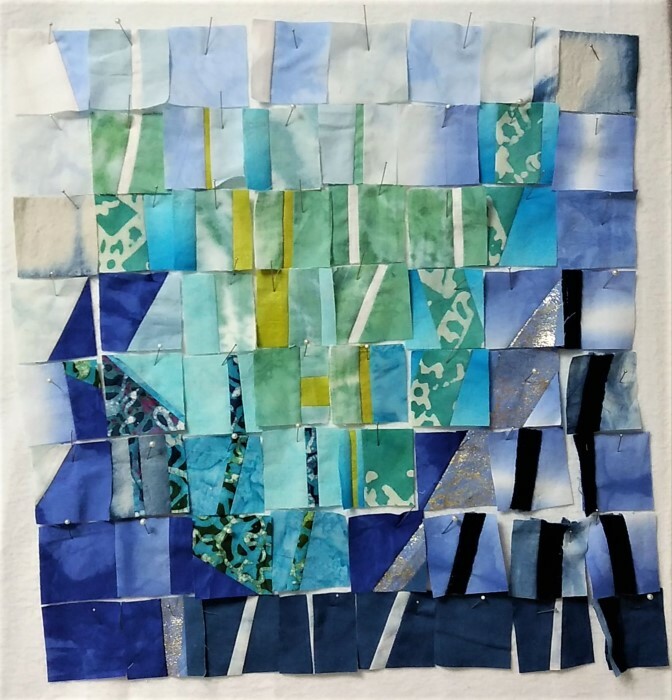 I recently read about an experiment where the dyer left pieces of fabric in an indigo vat overnight and compared those pieces to fabric that had been repeatedly dipped in the indigo. 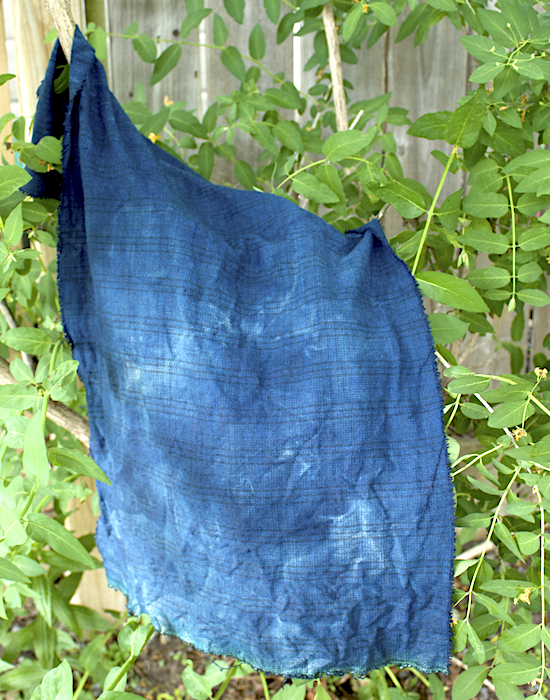 There was no difference in the depth of colour between the two, suggesting that repeated dips in indigo are not needed to dye a fabric, just a longer time in the vat. I haven’t washed these out yet, so I know that the colour will be lighter. 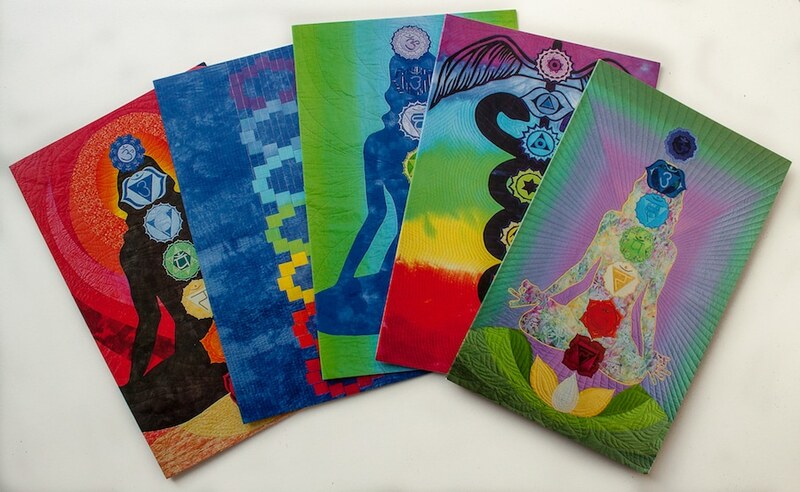 I am happy to have had more time experimenting with this fascinating process.